The tsunami that hit northern Japan today created an enormous whirlpool in a harbor off the east coast of that country. 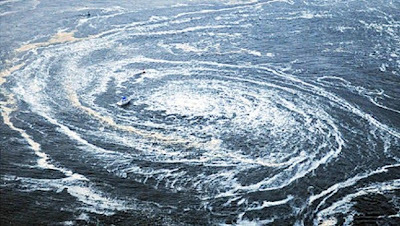 According to researchers, whirlpools aren't unusual after waves of this size. The tsunami was triggered by an 8.9-magnitude earthquake that struck off the coast of Japan at 2:46 p.m. Tokyo time. Video footage shows a boat swirling in the massive eddy. It's not known whether anyone was on the vessel. Based on eye-witness accounts and video in recent years, whirlpools probably occur with some regularity after large tsunamis, said Ruth Ludwin, a retired seismologist at the University of Washington in Seattle. "Whirlpools have a big impact on the human imagination," Ludwin said. "They're very notable and very frightening. But from the perspective of the geological record, they don't leave any particular sign that has been recognized so far." Whirlpools happen because of the interaction between rushing water and the geology of the coastline and seafloor, Ludwin said. "Obviously there is a lot of water that is being pushed around, and it is interacting with the shape, the bathymetry, near the coastline," she said. The first images and videos of post-tsunami whirlpools came out of the 2004 Indian Ocean tsunami, Ludwin said. But eyewitness accounts from previous coastal quakes suggest that tsunami whirlpools are nothing new. One was reported in the great Lisbon earthquake of 1775, Ludwin said. The Haida people of the Queen Charlotte Islands off the coast of British Columbia have myths about a whirling wave of foam.